Ed was a handsome Palomino/Saddlebred stallion with a lot of personality, not to mention patience. Wilbur, the guy who put a roof over his head, gave him a lot of trouble. Ed was sort of a cynic in a way, but you know what they say: scratch a cynic and find a romantic. Ed had a big heart. Mr. Ed had a lot of friends. He and Wilbur's wife had a sort of understanding. Ed had a grudging respect for her, and she felt the same way about him. They had to share Wilbur, but then they also shared getting Wilbur out of trouble. That cemented the bond. Thing about Ed was, he really needed Wilbur. Living in a garage with no other horses to pal around with, and no pasture to play in or trees to hang out under in the summer, he needed Wilber, especially since he was so easy to beat at chess. He also supplied a standing order of carrots, hay, sweet feed and nice, pure spring water. This is not to mention maid service, which a lot of people didn't know about. On the whole, life was pretty good. Behind the scenes: Mr. Ed was played by a Palomino/Saddlebred stallion named 'Bamboo Harvester'. He was liberty trained (no lead line) by Lester Hilton, who had learned a little from Will Rogers. The voice of Ed was performed by actor Allan "Rocky" Lane. Ed had a double! Pumpkin was a quarter horse but looked very much like Ed, except for a gold spot in the middle of his white blaze. This spot was covered with white makeup when he worked as Ed's replacement. Ed was jealous (really!) of Pumpkin, who lived in the stall next door. If visitors went to meet Pumpkin first, Ed would get really mad, and stomp out the back door of his stall into a paddock. He would not come back, even for carrots! 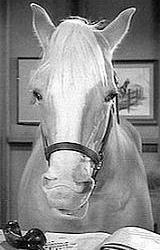 While "Mr. Ed" was supposedly an 8 yr old horse in the series, he was actually 11 when the series first went on the air, and 17 when it ran for the last time in 1966. Shortly after that, his health began failing. Arthritis and kidney problems made it difficult to get up and lay down, and Ed broke his leg. But 2 short years after the series ended, he had to be put down. 'Bamboo Harvester' was 19 years old. Pumpkin did the pudding commercials and other live appearances after that. They never told anyone at the time, figuring it might upset the kids that might be watching the syndicated reruns. Mr. Ed spent his last two years with trainer Les Hilton, who was also a legend of sorts. He got his start in Hollywood with the 'Francis the Talking Mule' movies from the late 40's & early 50's, and also trained the dark horse that played 'Fury' in the 50's TV series, and Wahama, the little chestnut Arabian mare that played 'Flicka' in the 'My Friend Flicka' TV series from that same period. Bamboo, however, is his most famous pupil. Les died in 1973, so we'll probably never really know just where "Ed" was buried. Info about 'Mr. Ed' courtesy of Gerry Lukacik. Listen to a song about 'Mr. Ed' by Gerry Lukacik! © 2004 'Right click' on the link to download to your PC.